Imagine if American Express, Capital One, Chase, Citi or Discover were to introduce a credit card with an APR of well over 20 percent -- and then said you could only use it only in a very limited number of outlets. What would it take for you to sign up? Would a one-off saving of up to $100 on your first purchases persuade you? Would invitations to future events that were designed to encourage you to spend more money have you reaching for your pen? Would the promise of money-off vouchers on unspecified items you may or may not need see you sign up? No? Congratulations. You're not crazy. But hold on a moment. Do you have a store card in your wallet? If so, the chances are you once signed up for a deal that was just as bad. Don't worry, that still doesn't make you crazy -- at least, no crazier than the millions of your fellow Americans who also have "private-label" (a.k.a. store or store-branded) cards. The fact is, it's not hard to find a mainstream credit card that delivers everything a store card does -- more, in fact -- and still charges a much lower interest rate. But we've all experienced it: You come to pay for some goods in a department or chain store, and the assistant launches into a high-pressure sales pitch to persuade you to apply for one of the retailer's credit cards. And the lures that are offered are -- at least superficially -- temptingly juicy. The big hook is the significant discount on the items you have in your hands. Why pay more than you have to? After all, you don't ever have to carry forward a balance, so that high interest rate is never going to apply to you. How many store cardholders who, according to Standard and Poor's, between them owed $52.8 billion just on private-label plastic in May 2012, vowed to themselves as they were signing the application form that they'd never run up a troublesome debt? Well, a whole lot, probably. Although there must be many, many others who made themselves that same promise and went on to keep it. As with all credit cards, there are few risks with store plastic if you're one of those lucky and/or clever people who absolutely always zero their card balances each and every month. The problem is, all too few of us are capable of exercising that self-discipline, and all too many of us quickly get ourselves into trouble. There are a very few situations in which a store card, used responsibly, can be a positive thing. Those with limited credit histories may find themselves more likely to be approved for one than for a mainstream credit card. And, for those consumers, having one can help establish their creditworthiness. What's strange, though, is that store cards remain as successful as they do when they offer so little to so many people. But they continue to do well. Writing in the American Banker magazine in December, Eric Lindeed traced their recent history. Only a couple of years ago, they were seen as a thing of the past. Retailers and financial institutions were tripping over each other in their eagerness to divest themselves of their private-label card businesses. 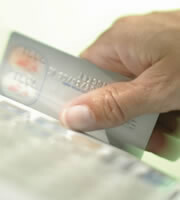 Private-label transactions are cheaper for the retailer to process because they have to pay lower or zero swipe fees. Store cards can help a retailer to build a relationship with a customer thereby promoting loyalty. Oddly, they carry a low credit risk. Perhaps because their credit card rates are so high, consumers tend to repay store-card debt first and so default less. They increase sales. If you can't afford to buy something with cash or a mainstream credit card, you might go ahead and buy it if the store's offering you the finance you need. Hmmm. Sounds a good deal from the retailers' and lenders' points of view. But that doesn't explain why so many consumers find store cards so alluring. That remains a mystery. 0 Responses to "Why do private-label credit cards still exist?"